By Sandy Siegman, M.S. Ed. Carl Sagan said, “Every kid starts out as a natural-born scientist.” Children are inquisitive learners who learn concepts through play because they are born with this natural curiosity. We should provide children an environment where they can build upon their natural inclination to explore, discover, and question. S.T.E.A.M. (or STEAM) learning begins early on and it involves all the hands-on experiences that children do every day. What is early STEAM all about? STEAM is the acronym for Science, Technology, Engineering, Art and Math. Early access to STEAM promotes early brain development. Science tells us a child’s brain development in the first five years of life significantly influences his/her ability to learn over a lifetime. Early learning opportunities will shape how the brain is built during this time. A strong brain will provide a child with a strong foundation for future success in school and later in life. Brain building will happen when children are exposed to rich experiences that stimulate all their senses, and are then enhanced even further when paired with powerful adult conversation. 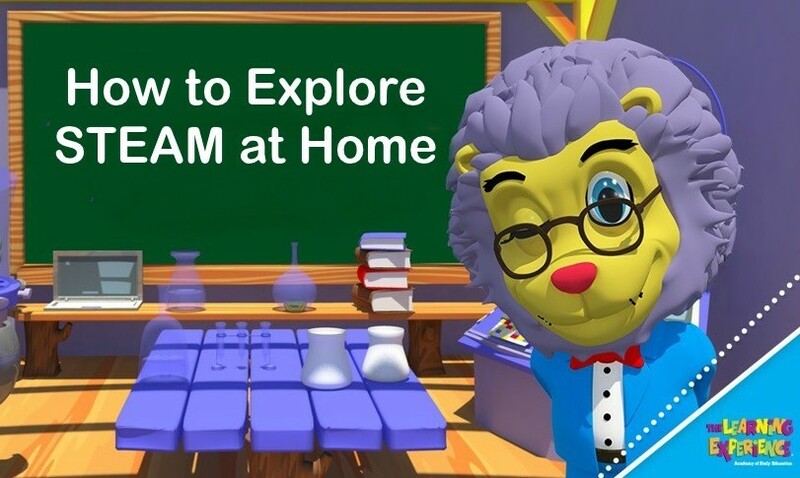 STEAM offers many opportunities for exploration and open-ended activities that will inspire children’s creativity and critical thinking. Children explore STEAM through their five senses. Babies will communicate their interests through kicking their hands or feet in excitement. They will smile, babble and squeal as they watch an adult’s expressions and actions. They are naturally curious and will repeat actions that have an interesting effect. As they grow older they will begin to look for answers. Encourage questions and follow your child’s natural inquisitiveness that lead them to areas of interest. See what else you can add to the fun and learning while keeping it playful. We can support STEAM by providing children with an array of materials, joining them in their explorations and connecting previous experiences to the present. Observe, explore and communicate with your child as they engage in activities. Focus on the process, not the outcome. Here are some STEAM infused ideas your child is probably already doing. Create ramps and send down all kinds of objects. Things that roll and bounce, things that have wheels but also introduce things that don’t roll to see what happens. Building with blocks provides many valuable experiences in problem-solving, imagination, self-expression, math, and creativity. Block play helps social and emotional growth because children are learning to take turns, cooperate with others and share materials. Use flashlights to explore shadows. Let them see what happens when they move their body or object closer to or farther from the light. Play Simon Says and offer children commands such as wave hello, show three fingers, etc. Go outside, find shadows and explore body movements. Sit under a tree’s shadow. Water play is always a hit with young children! Pick objects that will sink and float and give them different size cups for them to pour with. This develops eye-hand coordination, math and science concepts. Bubbles and Toddlers. Blowing bubbles is an oral-motor activity. It helps children learn how to round their lips into an “O” shape and control their breathing to blow. This helps with later speech development. Popping bubbles requires eye-hand coordination. Toddlers must focus and track the bubbles, then use their hands to pop them. Developing their eye-hand coordination early on will help later when your child is learning to write. Playgrounds are a perfect place to promote physical development, balance and coordination while learning spatial relationships. Take a child-friendly magnifying glass and find new discoveries. Provide a variety of materials for children to choose from to produce art. As they explore they are learning how to use materials. As they manipulate a paintbrush their fine motor skills are developing. Don’t have any expectations about the product, it’s all about the process.